An article by Staughton Lynd about the socialist revolutionary, Rosa Luxemburg. Rosa Luxemburg is the most significant woman in the history of revolutionary activity. For those of us seeking to create a synthesis of Marxism and anarchism, she is also the most significant individual— man or woman—in that tradition. It is appropriate to remember her on International Women’s Day. If I am not mistaken, it was Luxemburg’s friend and colleague Clara Zetkin who first proposed that there be such a day. 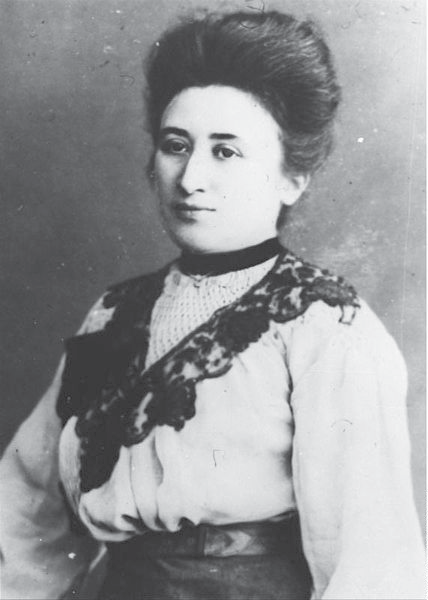 And apart from who said what when, Luxemburg was surely the guardian spirit of the female textile workers who went out onto the streets of St. Petersburg (now Leningrad) on International Women’s Day, 1917, and began the Russian Revolution. It seems that there were male radicals on the scene who told the women not to demonstrate because it would be too dangerous. The Cossacks were ordered three times to ride through the women. Three times they refused. Six months later, countless soldiers at the front lines would “vote with their feet” and come back to the cities to help overthrow the Czar. Luxemburg was born in Poland. She moved to Germany and became the fiery spokesperson for socialists opposed to the “reformism” of German socialist leaders. Like these leaders, Luxemburg attended socialist conferences at which delegates promised each other that, if the nations of Europe were to declare war, there would be an international general strike. Long before World War I, she foresaw the timid, bureaucratic mindset that would cause German Social Democratic representatives in the national legislature, like almost all their counterparts in the national legislatures of other European countries, to vote for taxes in support of that country’s war effort. Vladimir Lenin, too, condemned the treason of Social Democracy and took up agitation to turn the war, in every belligerent nation, into a civil war to overthrow capitalism. Those who shared this position came to be called Communists. But Luxemburg and Lenin had fundamental differences. Toward the end of the 1890s Lenin had been arrested and sent to Siberia. Joined by his wife, Krupskaya, the two spent their mornings translating books on trade unionism by Sidney and Beatrice Webb. The Webbs wrote about England, and, since England was the most industrially developed economy of the time, Lenin saw in what the Webbs described the future of his own country, Russia. The Webbs described the evolution of trade unionism in England from decentralized efforts characterized by “primitive democracy” and hatred of what William Blake called the “Satanic mills” into nationwide bureaucracies happy to make their peace with capitalism if their members might be provided with improved wages and benefits. Lenin dreaded that Russian workers, as well, would follow the English example and create self-interested, apolitical trade unions. He concluded that only if a “vanguard” party of radical intellectuals persistently spread left-wing political ideas among the workers would a Russian revolution be possible. And he said so, upon his return from Siberia, in a booklet entitled “What Is To Be Done?” published in 1902. The German government threw Luxemburg in prison because of her opposition to the war and to the German war effort. Her prison letters are extraordinary. When released from her cell for brief periods in which she might walk in a small courtyard, she was careful not to crush the structures made by ants and other burrowing insects. Meantime in Russia, the Bolsheviks under Lenin’s leadership had called for “all power to the soviets” and overthrown the Czar. From the isolation of her prison cell, Luxemburg wrote a series of remarkable critiques of what was going on in Russia. Fundamentally in solidarity with what Russian workers, peasants, and soldiers had brought about, she nonetheless begged them to remember that “Freiheit ist immer Freiheit fuer den andersdenkenden” (“Freedom is always freedom for the person who thinks differently”). Luxemburg was released from prison at the end of the war in November 1918. In her first public address after she was freed, Luxemburg said that some changes might have to wait until after the revolution, but something Germany should do right away was to abolish capital punishment. Workers’ and soldiers’ soviets sprang up all over Germany. Misunderstanding what was going on, Luxemburg’s colleague Karl Liebknecht prematurely called for a revolutionary uprising. Appalled, Luxemburg nevertheless remained in Berlin. A gaggle of counter-revolutionary thugs came to the place where she was living. “To what prison are you taking me?” she naively inquired. They shot her, and threw her body into a canal. Barely five feet tall, walking with a perpetual limp because of a childhood hip disorder, a Jew, a woman, and, during her political life and at her death, a refugee; Rosa Luxemburg may well be the most significant theorist of the 20th century labor movement. The working class self-activity that Rosa Luxemburg chronicled, praised, and advocated has recurred since her death in many places: Italy in the early 1920s, Spain and the United States in the 1930s, France in 1968, Poland in the first flush of Polish Solidarity, and elsewhere. It usually happens locally and perhaps especially among women (think of Walentynowicz and Pienkowska at the Gdansk shipyard). No one can be sure what the future significance of such activity will be. We can try to nurture in quiet times the horizontal, decentralized organizational forms based on solidarity, which, as Luxemburg showed, may explode from within the working class in moments of crisis.